Home Abigail Ahern's Blog Interior Design just got fun! Interior Design just got fun! The flea yesterday was rubbish, it rained and we all smelt! I didn’t check the weather before leaving and went round the market in ugg’s which I’ve discovered pong when they get wet. Add to that mixÂ two wet dogs and a vintage coat I pulled out of the wardrobe which I hadn’t worn in the rain before and to say the journey home was a bit wiffy is putting it mildly! I had to open the windows with rain coming in. Best forgotten about yesterday morning to say the very least. I spent the rest of the day working on the online course which starts May 1 cannot wait. In the course I will be pushing everyone to dare to be different in some way – because it means you end up with a home that is distinctly and beautifully yours. The course is a bit like a tool kit; pull from it what you want. Not everything I will bang on about you will agree with (can’t imagine why not but hey)!Â We are tearing up the rules, and we’re not going anywhere need trends or forecasts. I should say it distinctly has my vibe this course, obvious right since I’ve written it – so I’m not covering things that cause me to have an instant migraine or reaching for the pills. To be fair very little does except pastels and then you’ve lost me, I’ve either left the building or fainted – depends on the actual tone of the pastel! Chandeliers are hung to low in several of my rooms so that you either get a black eye or bump your head every time you go under them. Anyways I’m working on the practical aspect can’t be perfect at everything! My point really is that decorating is easy and its addictive, not only does it enhance your interior it boosts your mood. 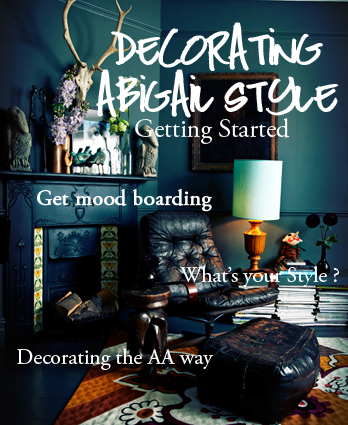 Decorating the AA way (I hope) gives you confidence to bend those rules and embrace what you love as I say in the title – interior design just got fun!